When you think of Samuel F. B. Morse, inventor of the Morse Code, you might imagine hawk-nosed old men in sleeve garters and green visors bent over dusty brass telegraph keys, tapping out passionless messages. Brother dead. Stop. Farm destroyed. Stop. 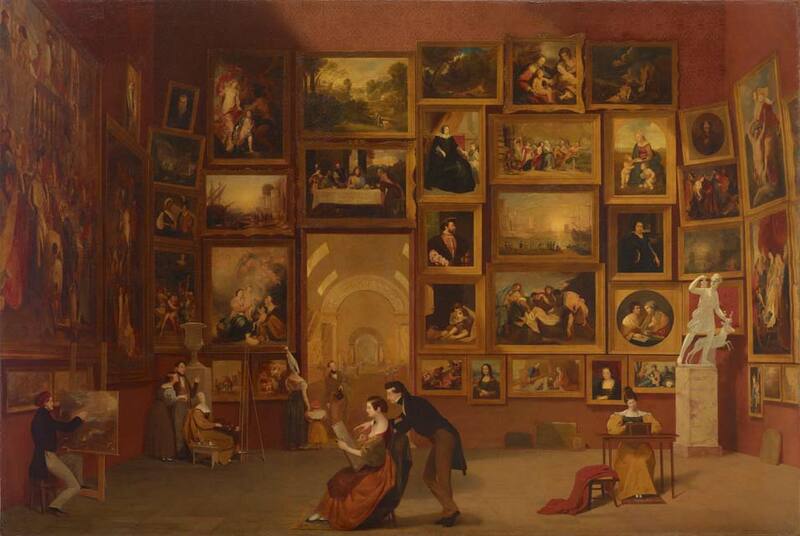 But did you know that before Samuel Morse developed his code, he was an accomplished painter? 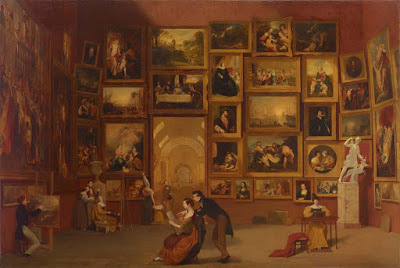 About four or five years before developing and patenting his Code, he painted his "Gallery of the Louvre," in which he imagines all the greatest paintings of the Louvre assembled in one room for artists to study. Go ahead. Click on the picture and open it up. How many masterpieces can you recognize? You should be able to see the Mona Lisa in the bottom row, centered. 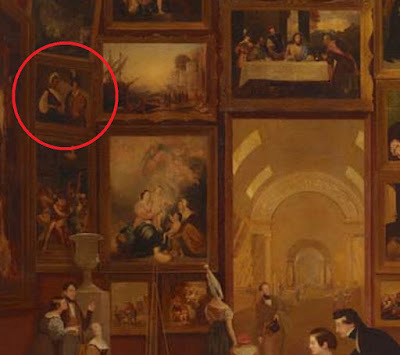 Can you spot the Caravaggio? Do you recognize it? No? How about now? What really struck me about Samuel Morse's work is that he recognizes the mastery of Caravaggio's work at a time when Caravaggio had, in the minds of many critics, become an obscure if not irrelevant Baroque artist. An 18th-Century ranking of 57 leading artists topped by Peter Paul Rubens put Caravaggio fifth from the last. Even 19th-Century romantics who should have been attracted to his energy and individualism were put off by his apparent lack of ethical goodness. The critic John Ruskin put Caravaggio among "the worshipers of the depraved." It is only since the 1950s, really, that Caravaggio has been restored to his rightful eminence as one of the greatest painters of all time. 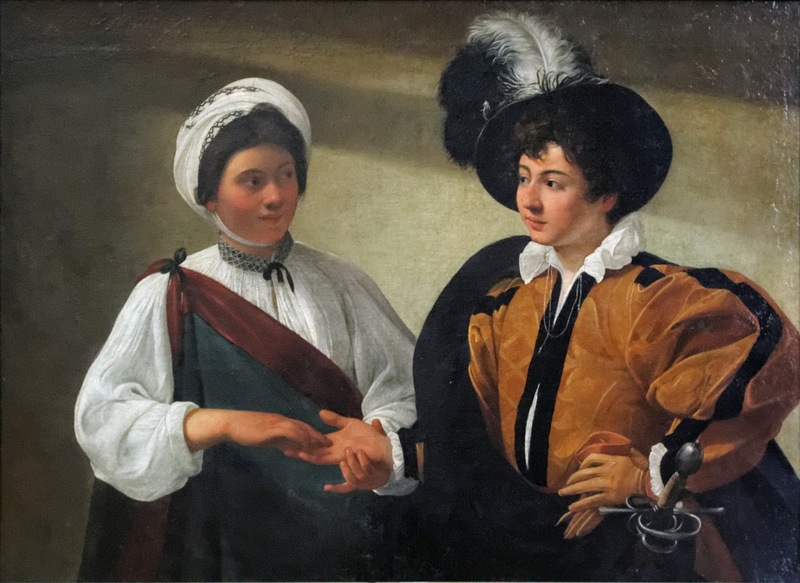 So it is satisfying for me to imagine Samuel Morse choosing this painting of Caravaggio's from all of the best works of the Louvre for his "dream" gallery, despite Caravaggio's critics. If you'd like to see Morse's "Gallery of the Louvre" up close, the Seattle Art Museum will be exhibiting the painting from September 16, 2015 – Jan 10, 2016.